One of the commercials I remember from childhood involves a Realtor driving a couple around a neighborhood and showing them ranch after ranch house plan even after the couple says, “Didn’t we say ‘No ranches?’” I can’t even remember the company or the point of that commercial but that one line got into my head and stayed with me. I grew up with this idea that ranch house plans were undesirable, so imagine my surprise to find out that ranch house plans are the most popular choice for house plans. Ranch house plans share one simple attribute: they are house plans with one-story living. Aside from that, ranch house plans can be as diverse in floor plan and exterior design as you want. 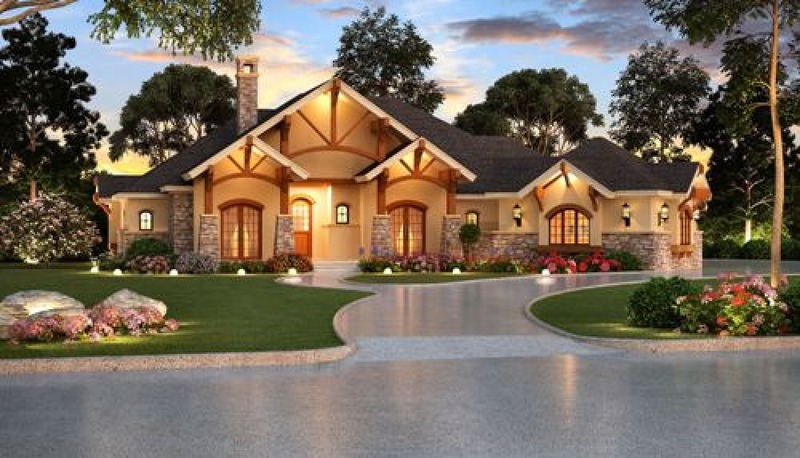 Whether you are looking for a small retirement cottage or a luxurious Mediterranean villa there is a ranch house plan for you. As an example of the exterior styles you can find, homes like the Park Place house plan have a modern exterior while the interior encourages occupants to lead an efficient lifestyle. Say, you want something a little more modern for your exterior style. Homes like The Park Place house plan give you that modern and contemporary styling while still giving you the efficiency of single-story living. The Park Place house plan has plenty of amenities embedded into the design that allow you to live efficiently and practically. A welcoming foyer houses lots of storage space for coats and shoes and minimizes the dust and dirt tracked into the house. The home office is directly accessible from the foyer, allowing business and pleasure to be co-located but still remain separate when needed. The office can also serve as a flexible space, easily becoming a guest room or additional bedroom. Craftsman house plans like the Aspen Creek pack a lot of punch into a single-story. If you need a home that is somewhat larger you can look at homes like the Aspen Creek house plan. Not only does it have ample space for four bedrooms and four bathrooms but it also has amenities like a cozy study, game room, and cooking patio. This house plan’s central zone is the main living area where you will find a family room, keeping room, and living room that are separated only by a breakfast bar. You can also enjoy the view outside from large windows while you keep cozy with two corner fireplaces in the living room and keeping room. Homes like the Lado del Rio house plan embrace the storybook cottage aesthetic while still giving you the advantages of a single story home. If you are looking for something that feels a little bit more like a cottage, then house plans like the Lado del Rio will be just your cup of tea. The Lado del Rio offers wide open planning and lots of room to grow. The spacious front porch is inviting and cozy and a large rear porch creates the perfect space for outdoor entertaining. With extra luxuries in the master suite like a walk-in shower and large walk-in closet you will find that this home has everything you could possibly want, all in one story. This is a small sample of the various exterior styles you will find when looking into a single-story floor plan. If you want to keep browsing you can take a look at the large ranch house plan collection from The House Designers.